Noodle cuisine originated around 5,000 B.C. in China. Evolving from the simple wheat noodle, Asian noodle choices are expansive and complement many dishes. Pan-fried, stir-fried or boiled, noodles are a traditional part of many Chinese, Japanese and Thai dishes. The nutritional content of these noodles varies as much as their texture and tastes. A mixture of eggs and wheat, egg noodles star in soup like chicken noodle or creamy dishes like beef stroganoff. These Asian noodles are the least heart-healthy with 19 g of fat per serving, on account of the cholesterol-rich egg content, according to Temple of Thai. Egg noodles come in a variety of types and flavors including enriched, added salt and spinach flavored. One 3/4 cup serving of these wide, flat noodles has 280 calories, 58 g of carbohydrates and 11 g of protein with a sodium overload of 2,760 mg per Temple of Thai. Similar to the Soba Japanese or the Chow Mein Chinese noodles, rice noodles come in a stick, sheet or vermicelli form. These noodles complement Asian dishes such as pad Thai as stick noodles or traditional won tons and spring roll wrappers when in sheet form. 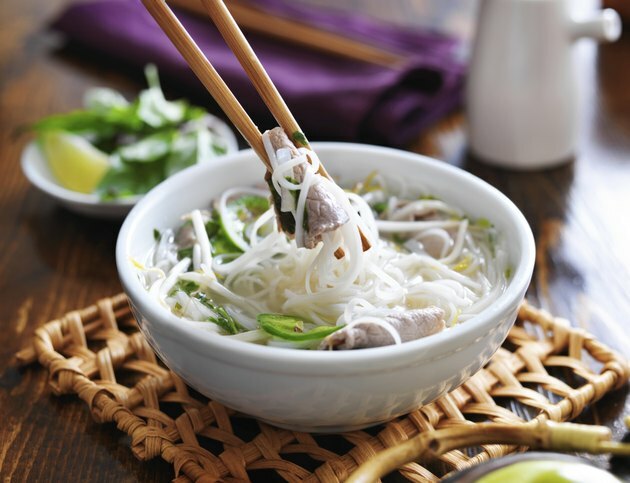 One 1/4 cup serving of cooked rice noodles provides a heart healthy snack that is devoid of fat and cholesterol, with 195 calories, 45 g carbohydrates and 3 g of protein, according to Temple of Thai. Prior to cooking, dried mung bean noodles look like a ball of twine. Clear, like glass, when cooked, mung bean noodles are traditionally used as a filler, like in spring rolls. The low-carb dieter may want to steer clear of these noodles, also called cellophane noodles, as these stringy guys have 65 g of carbohydrates in a 1 cup serving per Temple of Thai. They also contain 260 calories and no fat, cholesterol or protein.